The Orb-9 mission is almost accomplished because the Cygnus spacecraft can’t land and when it comes back into Earth’s atmosphere it will disintegrate. For this reason, it will be used to get rid of component failed or that can’t be used any longer on the International Space Station: all of that will be loaded on the Cygnus and will disintegrate along with it. 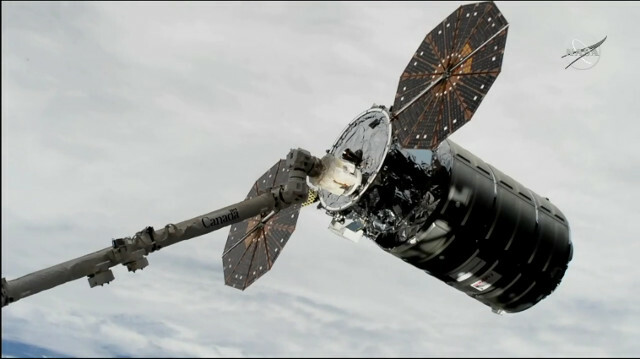 The Cygnus named “John Young” is scheduled to leave the International Space Station in a few weeks, in July. In these cases, an exact date for the cargo spacecraft departure is never given because it also depends on other tasks that can have higher priority. Tomorrow the International Space Station crew should open the Cygnus spacecraft’s hatch and at that point the cargo will be slowly brought to the Station. However, a few hours ago, the Russian Progress MS-10 space cargo ship arrived and there are only 3 crew members on the Station so priorities will likely be established following the crew’s tasks. Due to various changes in the two space cargo ships’ launch schedule, their launch and arrival was separated by a few hours and this led to a last-minute change in the Cygnus spacecraft’s manifest. According to the original programs, during its flight to the International Space Station the Cygnus was supposed to put into orbit 11 ThinSats – CubeSat-class nanosatellites – but there was a chance that they might end up on the trajectory of the Progress MS-10 therefore that operation was postponed, possibly to the next mission. Actually the risk was very small but nanosatellites could be too small to be detected by radar and in these cases safety is the priority. This is the 10th of 11 official missions established with the last extension by Northrop Grumman’s contract with NASA, acquired with Orbital ATK, to resupply the International Space Station. The next mission might start in April 2019.